Beyond the gateway here stands Brynawelon, once the home of Wales’ first female MP, Megan Lloyd George. It is now a nursing home. You are welcome to go into the grounds to view the house from outside, but please ring the bell to let the staff know of your presence. Megan’s father, David Lloyd George, became MP for Caernarvon Boroughs in 1890. He had married Margaret Owen, a local farmer’s daughter, two years previously and the couple made their home at Brynawelon, half of a large semi-detached house on Porthmadog Road, Criccieth. Parliamentary duties meant that he had to keep another home in London. 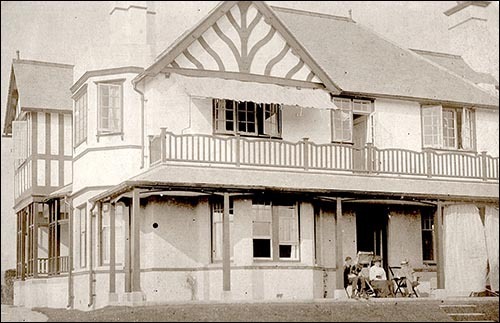 The family was raised in both places – with Megan spending some of her formative years in 10 and 11 Downing Street – but Margaret preferred to live at Criccieth. In 1909 David, by then Chancellor of the Exchequer, decided to build a fine new house here, overlooking the town with views over to Snowdonia. The architect was Rowland Lloyd Jones of Caernarfon. The name Brynawelon was moved from the old house. David became Prime Minister in 1916. The photo below, courtesy of the archive of Gussie Hermenie Durrad Cluley, shows the newly completed house c.1911, with David and Margaret sitting outside. Mar garet was made a Dame during the First World War for her voluntary work and made Brynawelon her home. She was elected to Criccieth Town Council in 1919 and worked indefatigably for the community, in addition to her constituency work on her husband’s behalf. 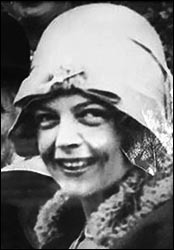 She died in 1941. Megan (pictured above right, courtesy of Jean Emberton) was the youngest daughter, born in 1902. She became Liberal MP for Anglesey in 1929 – the first female MP in Wales. She became Deputy Leader of the party but lost her seat in 1952. In 1955 she joined the Labour Party and won the Carmarthen seat in 1957. In 1954 she was elected Chairman of Criccieth Town Council. She inherited Brynawelon on her father’s death in 1945 and lived here for the rest of her life. She died in 1966. She became an MP in 1929. She inherited Brynawelon in 1945 on the death of her father, former Prime Minister David Lloyd George. It became her main home until her death in 1966.